My favourite scene in the film is when they’re on the run and hiding out in a camp they’ve made in the forest and Holly says “One day I carried 30 pounds of wood a distance of five miles, another day whilst hiding in the forest I covered my eyes in make-up to see how they’d come out” and the camera cuts from a close-up of Holly’s face with fairly amateur 60s style Twiggy eye make-up to them both dancing barefoot to “Love is Strange”. My heart literally melts in this scene; every couple dreams of having this moment of care free romance with their lover! Holly with her Dad, the sign restorer and painter. 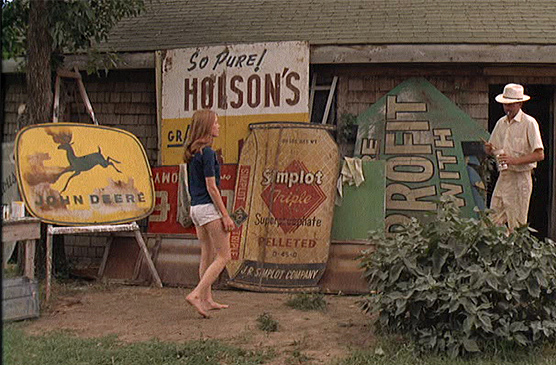 Her poor pop gets popped fairly early on in the film but I really enjoyed the few scenes he’s in with his ace collection of fading vintage signs and when he’s hand painting a gigantic billboard. A real visual feast! Forest life: hair in curlers with tomboy shorts & ruffle shirt. 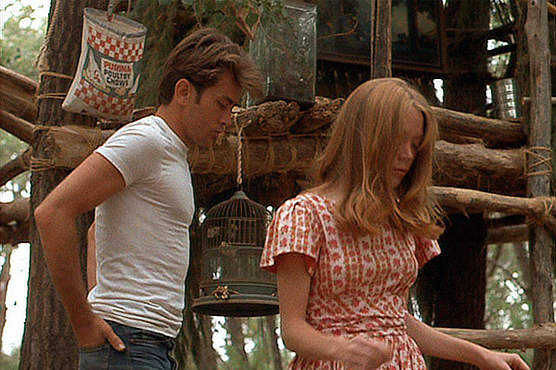 Hands down the one main reason I love this film: the style of Sissy Spacek. She nonchalantly passes the time in their woodland hideout wearing an array of cute looks from tomboy shorts with rollers in her hair; pastel 1960s dresses with neat white ankle socks and she has completely revived the retro ruffle shirt for me! I will seriously be channeling her vibe this Summer. Thinking about these scenes, they’re not a far cry from Moonrise Kingdom either. I wonder if Wes Anderson was also inspired by Badlands? I haven’t watched any other films with Sissy Spacek in so I’m off to update my Lovefilm list and if you have any recommendations let me know! I’m not sure if I’ll feature Riff Randell from Rock’n’Roll High School next or LA Joan from Nashville… I’m going to watch them both again away! Oh I love this write up, you make me want to see this film again! 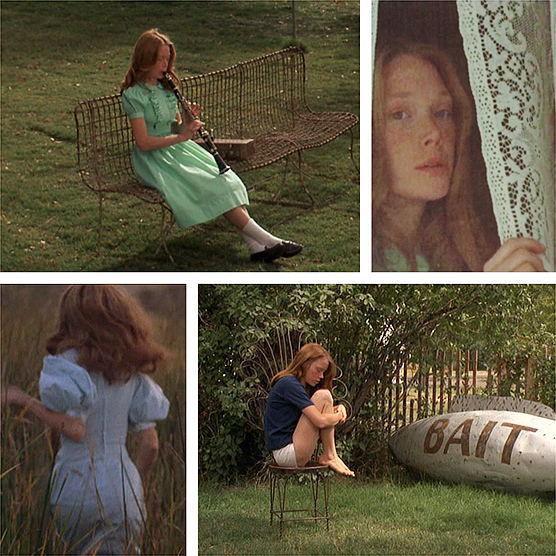 I just saw Straight Story recently, a really lovely David lynch film with sissy spacek – I’d definitely recommend it. Its unusual for a David lynch film in that, like it’s title it’s pretty straight! Oh wow, thanks for the recommendation! I’m definitely going to check this out.